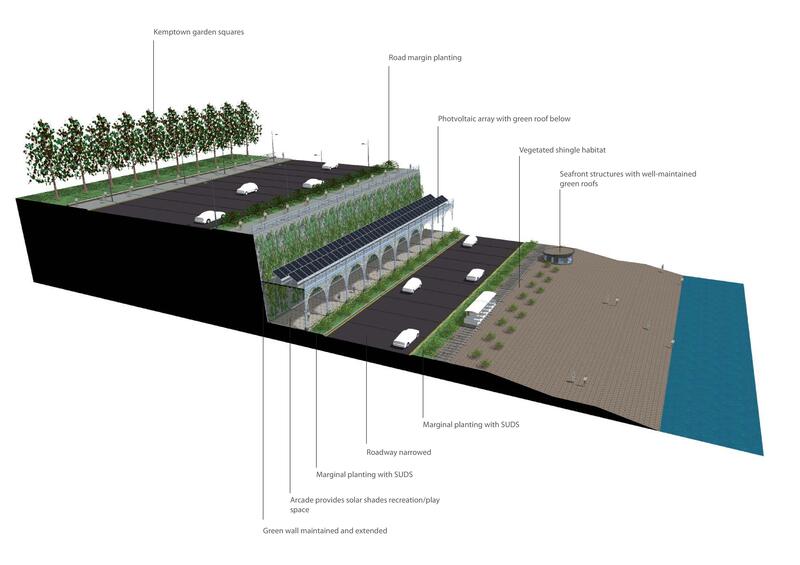 Urban designer Michael Doyle has produced these ideas for a new-look Madeira Drive. 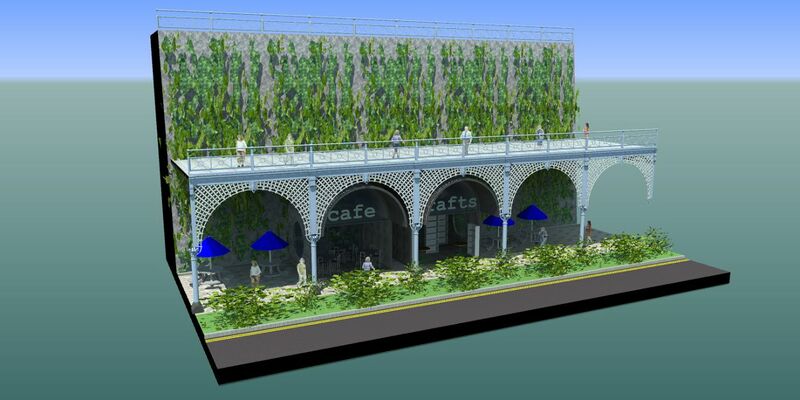 Based on designs published in the Argus in September, these new ideas incorporate the environmental infrastructure that is such an important part of our seafront. Michael is a local resident who runs an independent town planning and urban design practice. Building Green has met Michael to share ideas. In one design, photovoltaics could be mounted on the existing ironwork to provide some economic benefit and green electricity whilst longer term solutions are found. In another, cafes and shops could be assembled as pods that sit outside the terrace at first – providing business space now – and wheeled back under the terrace like Victorian bathing machines if and when a safe, longer term solution is found. The Council are in private talks over the future of the Madeira terraces, which are currently closed due to the deterioration of the antique Victorian ironwork. Ideas like those of Michael Doyle Building Green and the wider community should be heard as part of a wider debate and search for economic, sustainable solutions. 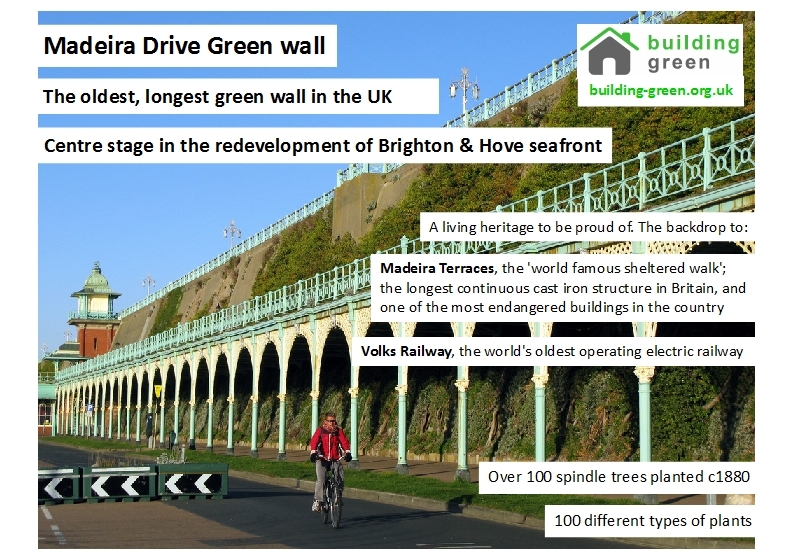 Building Green is highlighting the importance of the living ‘green wall’, which pre-dates the terraces and is notable for its age, uniqueness in the UK, its wildlife value and for improving the appearance of the East cliff. 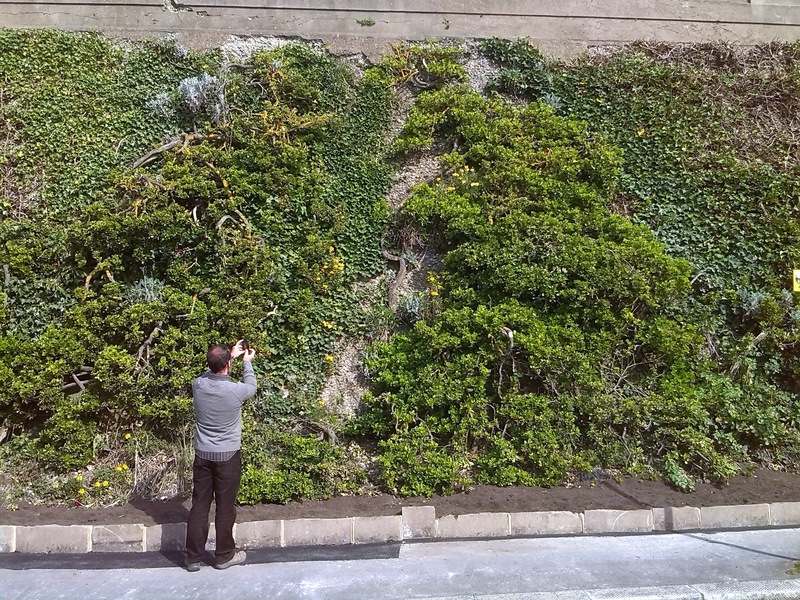 We are working with the Council to actively manage the only stretch of green wall that is currently accessible – which runs East along the ramp from Peter Pan to the top of Marine Parade. 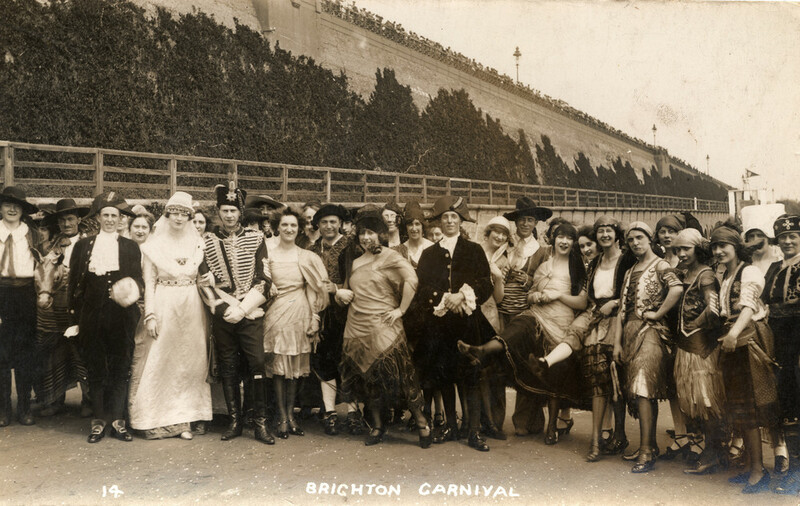 In the words of Council Leader Warren Morgan, “…we owe it to those who built our city’s heritage, and future generations, to save what we value in our historic city and add to the story of Brighton and Hove for the future.”. Photovoltaics could be established on the terraces where not safe to walk on. 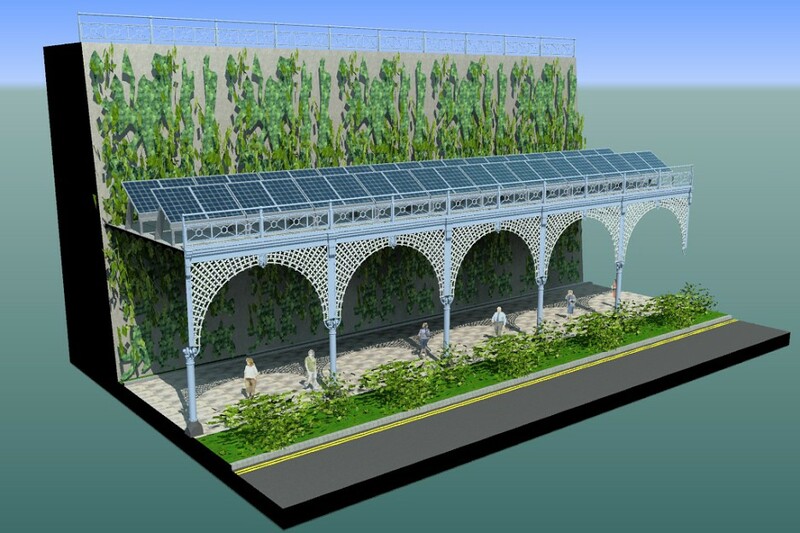 This can provide green electricity and some economic benefits, as well as a working platform for green wall maintenance. A striking way of visualising the environmental infrastructure in East Brighton. Connecting the downs to the sea via the squares, green wall and streets. Supporting wildlife and reducing surface water flood risk. This entry was posted in green wall, history, news and tagged environmental infrastructure, green wall, kemptown, Madeira drive, michael doyle, urban design. Bookmark the permalink.